Data gathered by Scrum Foundation founders Sutherland, renowned software productivity researcher Caper Jones from SPR and leading Scrum Consultants have measured gains ranging from 450-750% by Scrum teams over the velocity of waterfall projects. However over 90% of the Scrum teams are not able to deliver the velocity seen in high performance Scrum teams. Scrum teams have trouble measuring performance. Teams do not know their velocity of production and ways to improve and measure this rate. 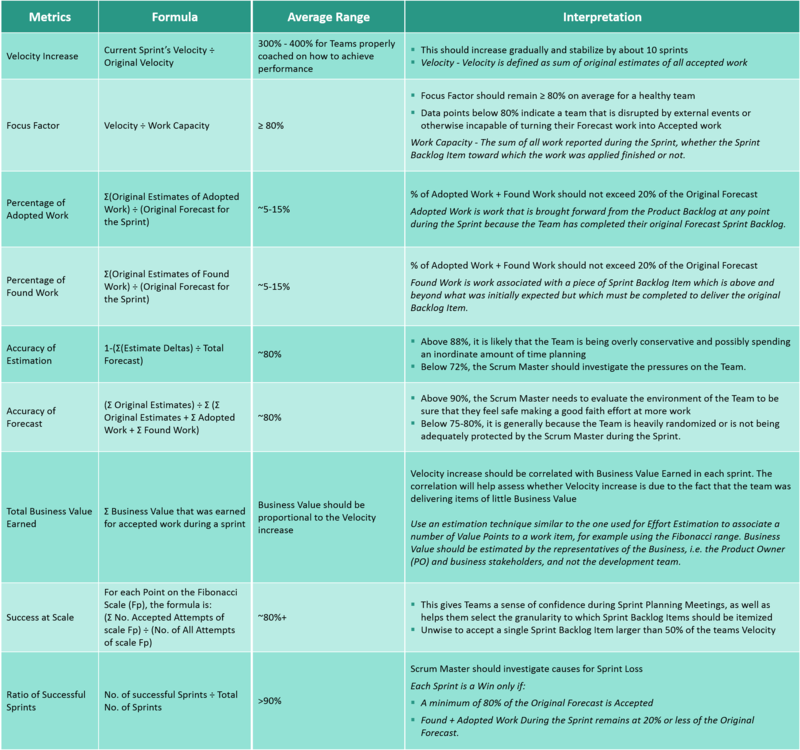 Management teams too are finding it difficult to compare performance of their Scrum teams. Scrum teams need a set of reliable light weight metrics so that Teams can monitor their performance easily and quickly correct if problems arise. The lack of appropriate metrics can prevent Scrum teams from systematically improving and reaching productivity significantly (~300-400%) better than the average waterfall team. Scrum & Management teams require understanding of the following ten vital aspects to understand the progress made and the issues requiring correction. 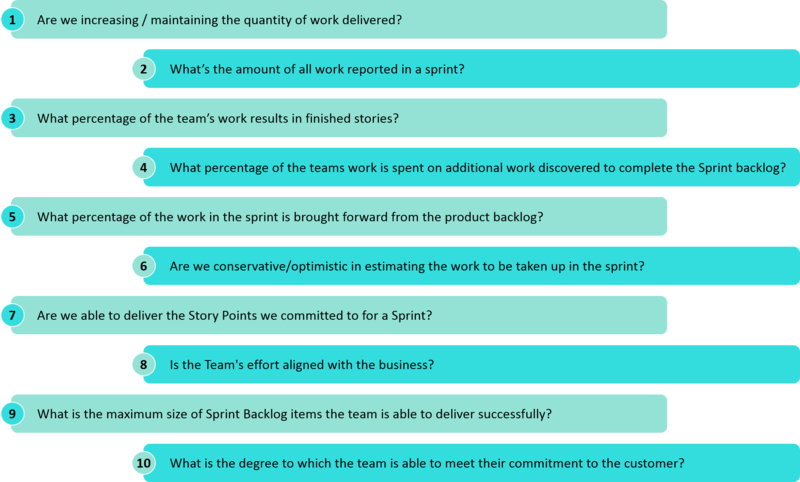 Here are ten metrics that can help Scrum & Management teams to answer the above questions to develop and sustain high performance—Velocity Increase, Work Capacity, Focus Factor, Percentage of Adopted Work, Percentage of Found Work, Accuracy of Estimation, Accuracy of Forecast, Total Business Value, Success at Scale, and the Ratio of Successful Sprints of the Team. Scrum teams should be encouraged to apply metrics to their Scrum processes, after all, the numbers tell the tale. In this whitepaper we provided a lightweight and understandable set of metrics that can be used to track a Scrum team’s performance. This simple s of metrics are easy to implement and have a powerful effect on the performance of Scrum Teams. Scott Downey& Jeff Sutherland, "Scrum Metrics for Hyperproductive Teams: How They Fly like Fighter Aircraft"
Jones, "Software Engineering Best Practices: Lessons from Successful Projects in the Top Companies" McGraw Hill, 2010.